Right now, across Wisconsin and the country, our shoreline communities face a variety of challenges to keep their harbors open, their waters clean and their beaches ready for visitors. Coastal managers and planners ask critical questions every day. How much is a shoreline likely to erode after a big storm? What are the water level trends at the marina where a dock is being installed? What is the local storm surge threat? In order for them to answer these questions and make the best decisions for their communities, they need the next generation of geospatial information to better prepare for storms, cope with varying water levels, and strengthen coastal economic development planning efforts. The National Oceanic and Atmospheric Administration (NOAA) currently assembles and hosts the Digital Coast Project, a collaborative online database of the most up-to-date coastal information, and makes it available to both the public and private sectors. Digital Coast also provides tools for coastal communities to decipher and use the high-tech mapping data to make accurate decisions and smart investments in their communities. In Wisconsin, we’ve already seen the positive effects of the Digital Coast Project. Residents in Green Bay have raised concerns about flooding caused by the Lake Michigan and their individual proximity to the flood zone. By using data and visualization tools provided through the Digital Coast Project, managers at Brown County are able to give property owners in Green Bay insight in what to expect from potential flooding and how to protect themselves and their property. But, the program is not complete. That’s why I worked across party lines with Sens. Lisa Murkowski and Dan Sullivan of Alaska, and Sen. Cory Booker of New Jersey, to introduce the Digital Coast Act, in order to authorize the next phase in coastal mapping at NOAA. This reform ensures that our coastal communities have the resources and tools they need to adapt to changing environmental conditions, maintain healthy shores, and make smart planning decisions to support their local economies and way of life. It supports further development of the current project, including increasing access to uniform, up-to-date data to help communities get the information they need to respond to emergencies, plan for long-term coastal resilience, and manage their water resources. We’ve gained wide support for the bipartisan legislation from the American Planning Association and other groups, including the Association of State Floodplain Managers, Coastal States Organization, MAPPS, National Association of Counties, National Estuarine Research Reserve Association, National Society of Professional Surveyors, National States Geographic Information Council, The Nature Conservancy, Ayers Associates, Continental Mapping Consultants, and Quantum Spatial. Last November, the Digital Coast Act unanimously passed the Senate. Now that the new Congress is under way, I have reintroduced the legislation along with Sens. Murkowski, Sullivan, and Booker, and it has already passed the Senate Commerce Committee. Now it moves to consideration by the full Senate. I am proud of the progress we have made in moving bipartisan reforms forward and I am hopeful that the Digital Coast Act will soon be signed into law. However, right now we have another challenge for coastal managers and planners, and the communities they serve. President Trump’s budget proposal would make drastic cuts to NOAA, endangering the Digital Coast Project and the data that we use to protect and strengthen coastal communities. These cuts would be a step back at a time when we should be investing and protecting our coastal communities — not leaving them to fend for themselves without any of the data and tools needed to protect lives and properties. Together, we must continue to push for progress by promoting investments in and access to the next generation of land and coastal information systems to support our nation’s coastal planners, managers, and communities. Take two minutes to ask your legislators to support investment in coastal data resources using APA's Legislative Action Center. Top image: Milwaukee on Lake Michigan. Photo by Flickr user Erin (CC BY-NC 2.0). 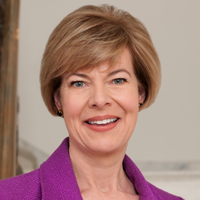 Tammy Baldwin has served as the junior senator from Wisconsin since 2013. Previously she was a member of the U.S House of Representatives from Wisconsin's 2nd district.